Latin was originally spoken in the area around Rome, known as Latium. Through the power of the Roman Republic, it became the dominant language, initially in Italy and subsequently throughout the western Roman Empire. 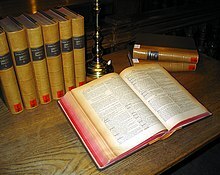 Vulgar Latin developed into the Romance languages, such as Italian, French, Portuguese, Romanian, and Spanish. Latin, Greek and French have contributed many words to the English language. In particular, Latin (and Ancient Greek) roots are used in English descriptions of theology, biology, science, medicine and law. By the late Roman Republic (75 BC), Old Latin had been standardised into Classical Latin. Vulgar Latin was the colloquial form spoken during the same time and attested in inscriptions and the works of comic playwrights like Plautus and Terence. Late Latin is the written language from the 3rd century and Medieval Latin was used from the 9th century to the Renaissance which used Renaissance Latin. Later, Early Modern Latin and New Latin evolved. Latin was used as the language of international communication, scholarship and science until well into the 18th century, when it began to be supplanted by vernaculars. Ecclesiastical Latin remains the official language of the Holy See and the Roman Rite of the Catholic Church. Despite dialectal variation, which is found in any widespread language, the languages of Spain, France, Portugal, and Italy retained a remarkable unity in phonological forms and developments, bolstered by the stabilising influence of their common Christian (Roman Catholic) culture. It was not until the Moorish conquest of Spain in 711 cut off communications between the major Romance regions that the languages began to diverge seriously. 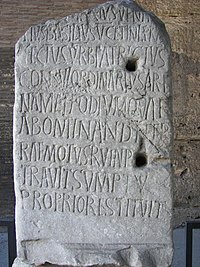 The Vulgar Latin dialect that would later become Romanian diverged somewhat more from the other varieties, as it was largely cut off from the unifying influences in the western part of the Empire. The largest organisation that retains Latin in official and quasi-official contexts is the Catholic Church. Latin remains the language of the Roman Rite; the Tridentine Mass is celebrated in Latin. Although the Mass of Paul VI is usually celebrated in the local vernacular language, it can be and often is said in Latin, in part or in whole, especially at multilingual gatherings. It is the official language of the Holy See, the primary language of its public journal, the Acta Apostolicae Sedis, and the working language of the Roman Rota. Vatican City is also home to the world's only automatic teller machine that gives instructions in Latin. In the pontifical universities postgraduate courses of Canon law are taught in Latin, and papers are written in the same language. Some films of ancient settings, such as Sebastiane and The Passion of the Christ, have been made with dialogue in Latin for the sake of realism. Occasionally, Latin dialogue is used because of its association with religion or philosophy, in such film/ television series as The Exorcist and Lost (" Jughead"). 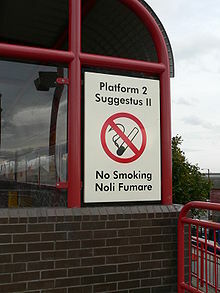 Subtitles are usually shown for the benefit of those who do not understand Latin. There are also songs written with Latin lyrics. The libretto for the opera-oratorio Oedipus rex by Igor Stravinsky is in Latin. 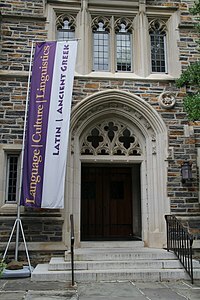 The Latin influence in English has been significant at all stages of its insular development. In the Middle Ages, borrowing from Latin occurred from ecclesiastical usage established by Saint Augustine of Canterbury in the 6th century or indirectly after the Norman Conquest, through the Anglo-Norman language. From the 16th to the 18th centuries, English writers cobbled together huge numbers of new words from Latin and Greek words, dubbed " inkhorn terms", as if they had spilled from a pot of ink. Many of these words were used once by the author and then forgotten, but some useful ones survived, such as 'imbibe' and 'extrapolate'. Many of the most common polysyllabic English words are of Latin origin through the medium of Old French. Romance words make respectively 59%, 20% and 14% of English, German and Dutch vocabularies. Those figures can rise dramatically when only non-compound and non-derived words are included. 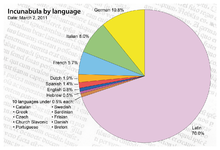 A few international auxiliary languages have been heavily influenced by Latin. Interlingua is sometimes considered a simplified, modern version of the language. [ dubious – discuss] Latino sine Flexione, popular in the early 20th century, is Latin with its inflections stripped away, among other grammatical changes. 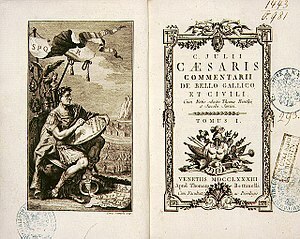 Throughout European history, an education in the classics was considered crucial for those who wished to join literate circles. Instruction in Latin is an essential aspect. In today's world, a large number of Latin students in the US learn from Wheelock's Latin: The Classic Introductory Latin Course, Based on Ancient Authors. This book, first published in 1956,  was written by Frederic M. Wheelock, who received a PhD from Harvard University. Wheelock's Latin has become the standard text for many American introductory Latin courses. 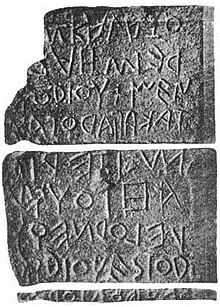 Latin was written in the Latin alphabet, derived from the Old Italic script, which was in turn drawn from the Greek alphabet and ultimately the Phoenician alphabet. This alphabet has continued to be used over the centuries as the script for the Romance, Celtic, Germanic, Baltic, Finnic, and many Slavic languages ( Polish, Slovak, Slovene, Croatian, Bosnian and Czech); and it has been adopted by many languages around the world, including Vietnamese, the Austronesian languages, many Turkic languages, and most languages in sub-Saharan Africa, the Americas, and Oceania, making it by far the world's single most widely used writing system. W was created in the 11th century from VV. It represented /w/ in Germanic languages, not Latin, which still uses V for the purpose. J was distinguished from the original I only during the late Middle Ages, as was the letter U from V.  Although some Latin dictionaries use J, it is rarely used for Latin text, as it was not used in classical times, but many other languages use it. Irregular verbs may not follow the types or may be marked in a different way. The "endings" presented above are not the suffixed infinitive markers. The first letter in each case is the last of the stem so the conjugations are also called a-conjugation, e-conjugation and i-conjugation. The fused infinitive ending is -re or -rī. Third-conjugation stems end in a consonant: the consonant conjugation. Further, there is a subset of the third conjugation, the i-stems, which behave somewhat like the fourth conjugation, as they are both i-stems, one short and the other long. The stem categories descend from Indo-European and can therefore be compared to similar conjugations in other Indo-European languages. As Latin is an Italic language, most of its vocabulary is likewise Italic, ultimately from the ancestral Proto-Indo-European language. 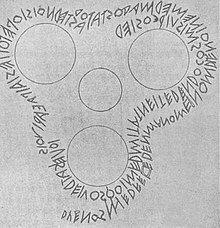 However, because of close cultural interaction, the Romans not only adapted the Etruscan alphabet to form the Latin alphabet but also borrowed some Etruscan words into their language, including persona "mask" and histrio "actor". Latin also included vocabulary borrowed from Oscan, another Italic language. Because of the Roman Empire's expansion and subsequent trade with outlying European tribes, the Romans borrowed some northern and central European words, such as beber (beaver), of Germanic origin, and bracae (breeches), of Celtic origin. The specific dialects of Latin across Latin-speaking regions of the former Roman Empire after its fall were influenced by languages specific to the regions. 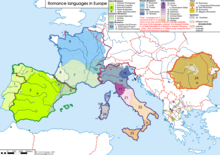 The dialects of Latin evolved into different Romance languages. During and after the adoption of Christianity into Roman society, Christian vocabulary became a part of the language, either from Greek or Hebrew borrowings or as Latin neologisms. 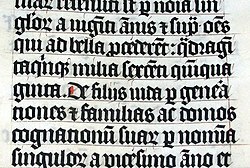 Continuing into the Middle Ages, Latin incorporated many more words from surrounding languages, including Old English and other Germanic languages.
" Classical Language Toolkit" (CLTK). A Natural Language Processing toolkit for Python offering a variety of functionality for Latin and other classical languages.